New Blueberry Thyme Fragrance Oil – part of the Farmers Market Collection – is inspired by artisan cocktails that blend sweet and savory elements. It has notes of lemon, Spanish rosemary, and vanilla. Those notes inspired the design in this cold process recipe. A combination of red sandalwood powder and Caribbean Blue Mica create light and dark navy shades. The sandalwood powder adds speckles for a natural look. Between each layer there’s a titanium dioxide pencil line to add interest. Finally, a fork is used to create texture on top and it’s finished with blackberry seeds. Blueberry Thyme Fragrance Oil discolors to a light ivory. 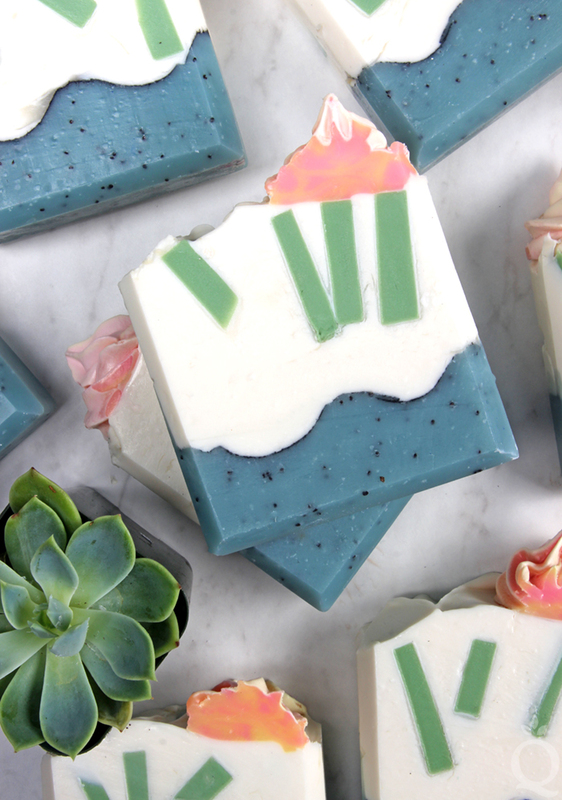 You’ll notice the soap in these photos look slightly green, while the final bars look more blue. This could be due to the fragrance oil or the sandalwood powder – we aren’t quite sure. This recipe uses a low fragrance oil usage rate to keep any discoloration to a minimum. Gold and pink is a sophisticated color combination. It feels appropriate for the holidays, but also shines for Valentine’s Day and spring. 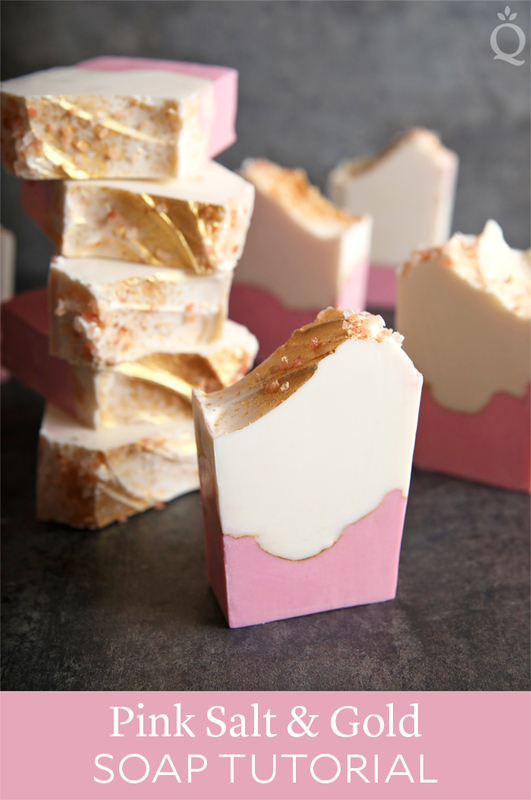 That color combination inspired this soap, which is topped with Gold Sparkle Mica and pink sea salt. The colors also make an appearance inside the bar with a pink layer and gold mica line. We scented the batch with Rose Quartz Fragrance Oil. It’s a bright combination of grapefruit, jasmine, and traditional rose notes. It does slightly accelerate, but that works well for the layered design and textured top. 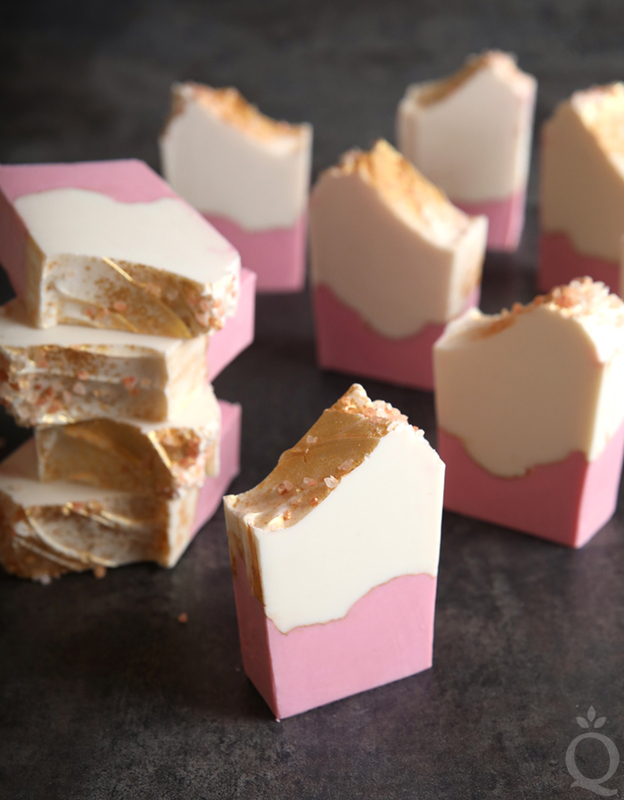 The pink sea salt is sprinkled on top for texture and color. Gently pressing the salt into the soap helps the salt stick, but some will fall off when cut. To achieve a nice white color, we added plenty of titanium dioxide. When a large amount of titanium dioxide is used it can lead to glycerin rivers – learn more about them here. One of the best ways to prevent glycerin rivers is to use a water discount. That can lead to trace thickening more quickly, so use your stick blender sparingly for this recipe. Nature is full of inspiration. 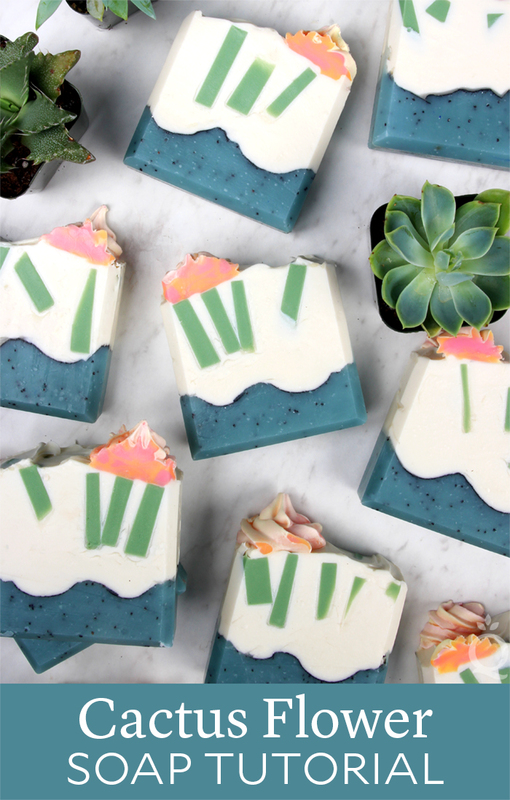 This Cactus Flower Soap was inspired by the colors and textures of a blooming cactus, along with our new Cactus Flower Fragrance Oil. It’s fresh and green take on a floral scent, with notes of violet petals, lemon, and white musk. 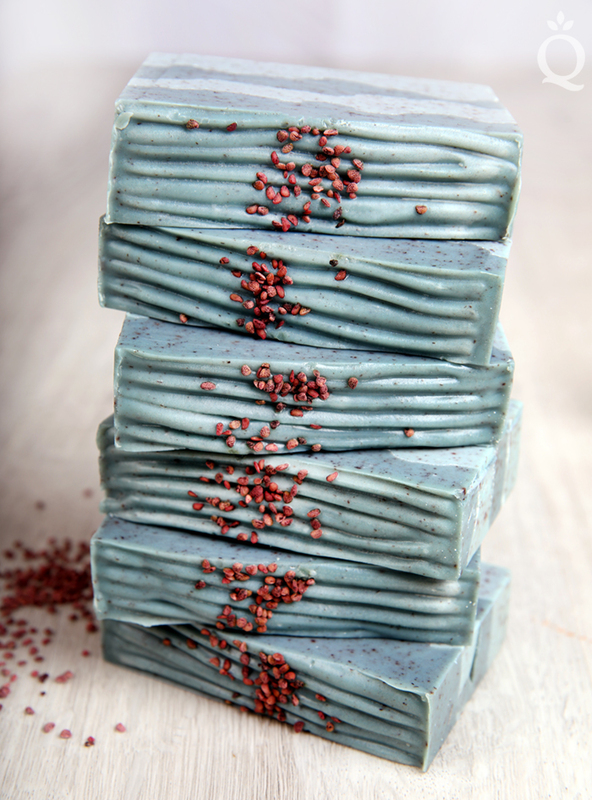 It behaves wonderfully in soap and gives these bars the perfect floral scent. 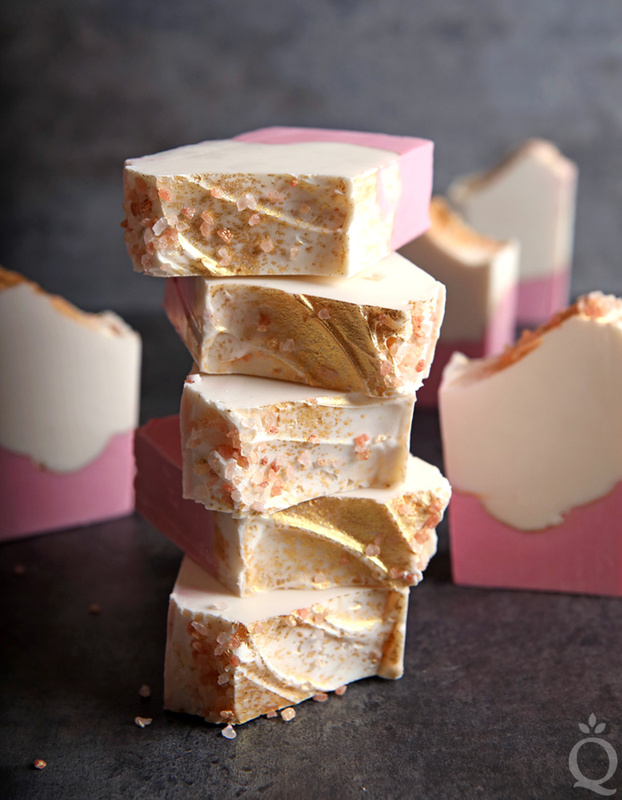 This beautiful photograph led us in designing the colors, layers, and textures of this soap. 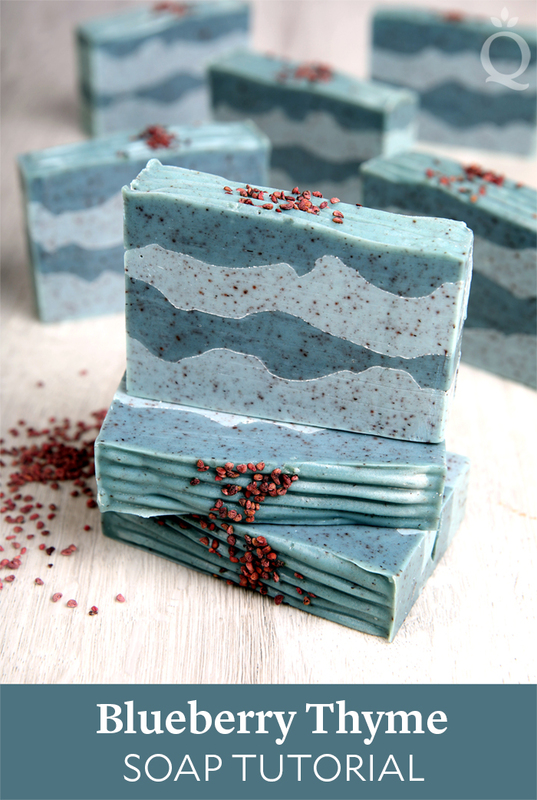 The first layer is created using Bright Blue Jean Colorant, with poppy seeds to mimic the texture of a cactus. An activated charcoal line separates the white and blue layers. Finally, green melt and pour embeds and soap “flowers” add color and interest. The melt and pour embeds do need to be created several hours in advance to allow them to cool and harden. 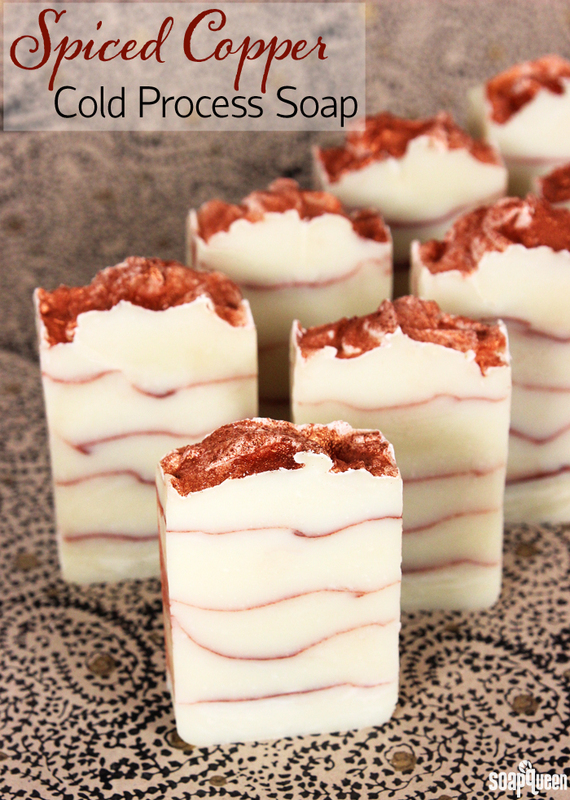 We recommend using LCP White Melt and Pour Soap Base when embedding into cold process soap. LCP stands for “like cold process” and refers to melt and pour soap that contains less glycerin. It melts at a slightly higher temperature, which helps prevent some morphing or melting if the soap goes through a hot gel phase. LCP bases are also less likely to develop glycerin dew. This recipe should be kept cool to prevent the embeds from melting. A slightly lower soaping temperature will also prevent glycerin rivers from forming in the white layer. This recipe does use a 10% water discount to further prevent glycerin rivers. Lower soaping temperatures also help achieve a thicker texture and prevent the soap flowers from melting. If you live in a very hot climate, you’ll probably want to place this soap in the fridge for several hours. 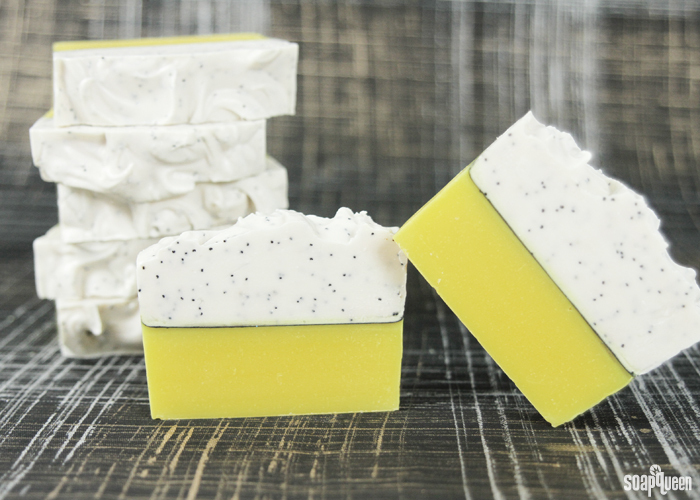 Bright and cheery, it’s no wonder the Lemon Poppy Seed Cold Process was the top tutorial from 2014! 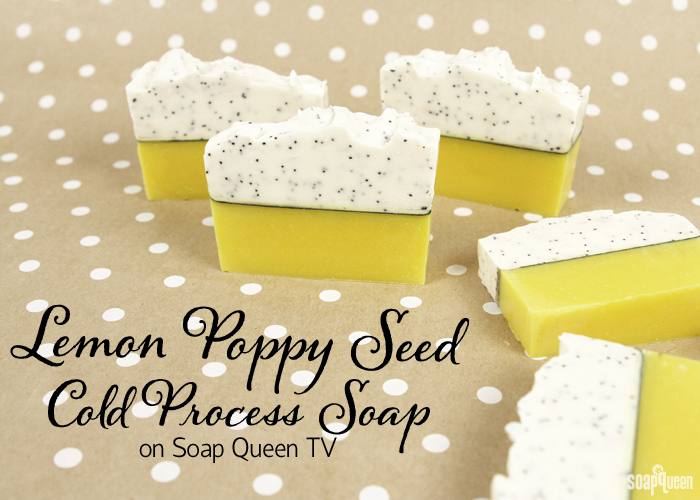 With so much great feedback, you can now watch this project from start to finish in the Lemon Poppy Seed Cold Process video on Soap Queen TV. 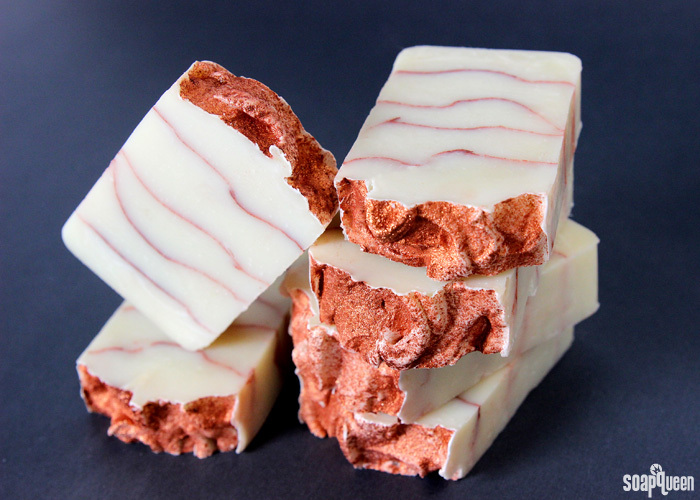 This soap is an advanced project, with a super straight mica vein and textured top. The fragrance combination of Lemon Verbena Yankee Type and Champagne smells bubbly and slightly sweet. 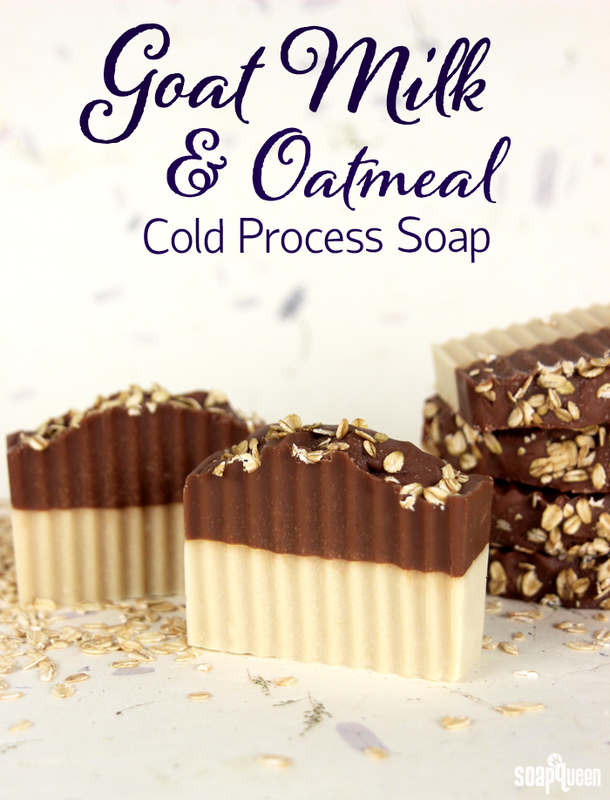 When you don’t have time to make cold process soap, hot process soap making is a good next choice. The extra heat speeds up the saponification process, which cuts down on cure time. 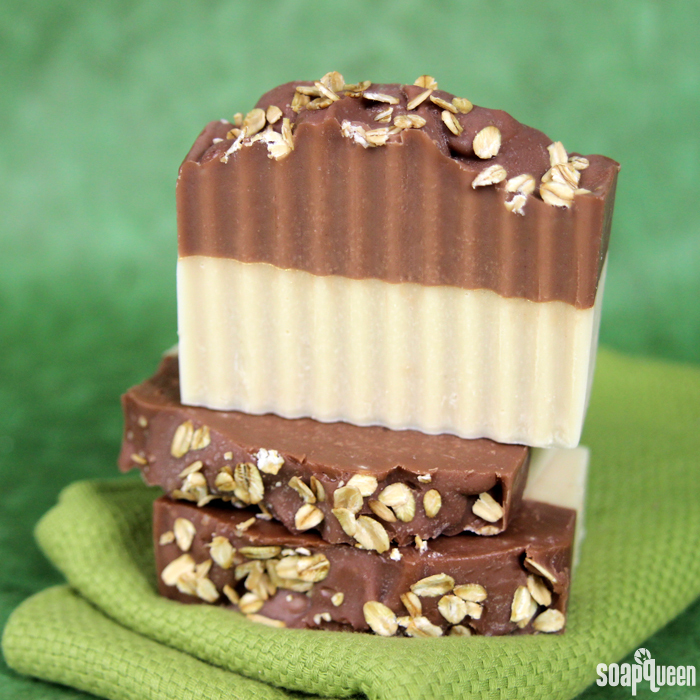 Hot process soap only requires 1-2 days in the mold, even with palm-free recipes like this one. 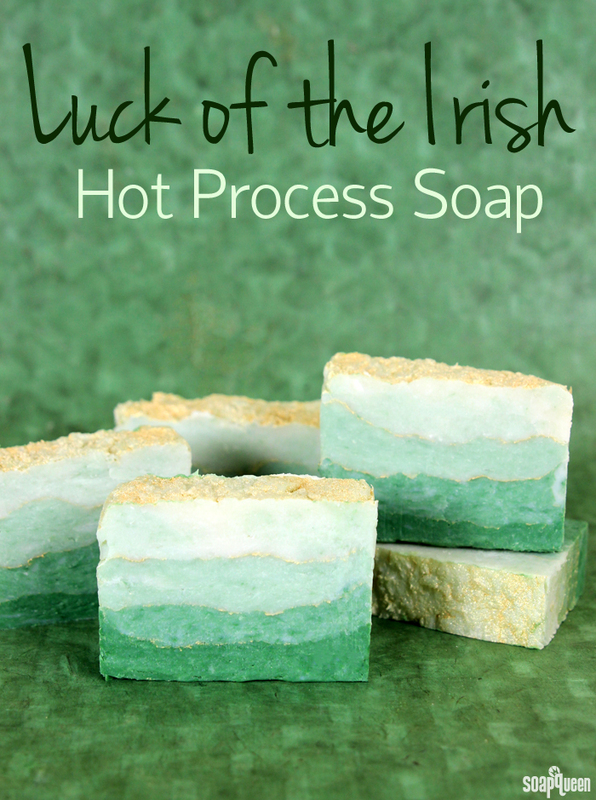 With St. Patrick’s Day right around the corner, this hot process soap will be ready in time to celebrate the holiday. 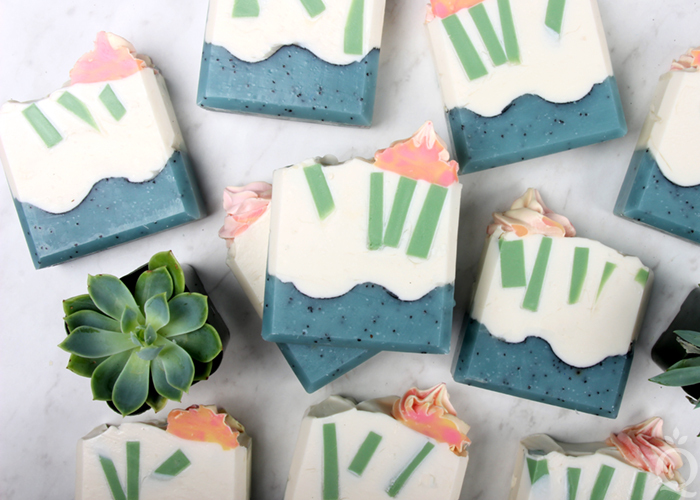 This Luck of the Irish Hot Process soap features layers of green ombré. Each layer is defined with a line of Gold Sparkle Mica, which adds plenty of shimmer. Don’t use too much mica – a thick mica vein may cause the layers to separate from each other. When creating this effect it’s important to work fast. Hot process soap has a tendency to thicken quickly, which can make creating even layers tricky.